This International Working Women’s Day, March 8, we women must unite to fight repression, fascism, militarization and wars of aggression. Just as we are taking part in struggles to defend our lands, our jobs, our livelihood and our rights, we must join the struggle for peace based on justice and equality. This is the legacy of International Working Women’s Day, which was established in 1910. We should affirm our commitment to build a strong women’s movement towards women’s emancipation. Women will never be free in a monopoly capitalist economy where crises plague us all and where imperialist wars of aggression are inevitable. We must continue to defend our countries from foreign aggression, and defend our sovereignty toward national and social liberation. There are women all over the world resisting wars of aggression and occupation. Women have joined and organized solidarity and protest actions against U.S. wars in Afghanistan, Iraq, Kurdistan, Syria and against the occupation of Palestine. 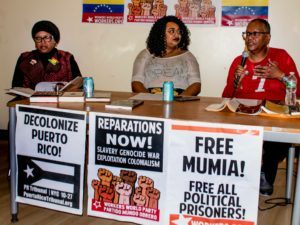 Women in the Global North oppose the increasing fascism and militarization in their respective countries, and denounce their governments’ role in the aggression and invasion of foreign countries to further imperialist interests and subjugate peoples. This March 8, the International Women’s Alliance and its member organizations will join the call to resist imperialist plunder and war. Monopoly capitalism is in deep crisis. As the second Cold War heats up, imperialist powers led by the U.S. prepare for the eventuality of a world war. They have intensified their regional wars and occupations across the globe — in the Middle East, Asia, Africa and Latin America — to maintain political and economic hegemony. They have propped up puppet and client regimes to protect their economic interests all over the world. They have compelled countries to pass anti-terrorism and counterinsurgency measures targeting leaders, women and men, of national movements of resistance. 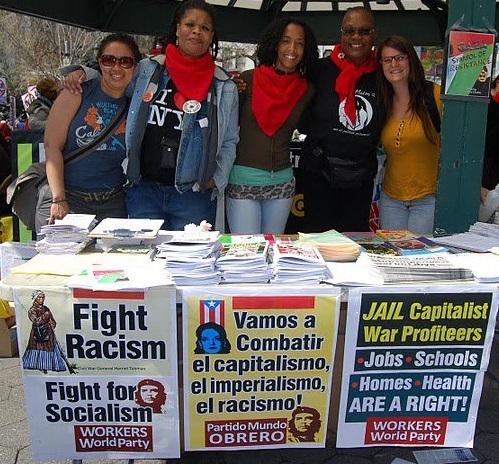 Resistance against imperialism has been met with violence and repression. Sexual violence against women is systematically used as a tool of war and to curtail the fundamental rights of the people. Militarization of communities is used to crush social movements fighting government anti-people policies. Treaties and agreements have been laid down for rapid deployment of U.S. troops for interventionist wars in West Asia and the Middle East and to block off Russia, China and North Korea. With the U.S. “pivot” to Asia, the U.S. has laid down the framework for expanding its strike capacity. Through the Visiting Forces Agreement and the Enhanced Defense Cooperation Agreement in Australia, the Philippines and Singapore, the U.S. has unrestricted basing access anywhere in these countries. The U.S. has also developed joint military exercise programs that engage the services of each nation. It conducts ballistic missile training using the Patriot System at its bases and has confirmed the deployment of the most advanced missile defense systems in the world, the Terminal High-Altitude Area Defense or THAAD. The U.S. has also succeeded in “normalizing U.S.-Vietnam relations” with the Joint Vision Statement signed in May last year. It has ensured the support of Japan for the wars of aggression with the signing of the Security Laws that allow the militarization of Japan despite its Constitution prohibiting the maintenance of standing armed forces. Both Thailand and the Philippines signed a Mutual Defense Cooperation with the U.S.
As the imperialists rev up their engines of war, they are igniting the resistance of the women of the world. And as capitalist exploitation and oppression intensify, women are rising in struggle and protest. Peasant and Indigenous women, the poorest of the poor, have seen states broker their lands to transnational corporations and despotic local landlords connive with foreign interests to turn lands into corporate farms, mines, eco-tourist playgrounds and military camps that displace peoples and communities. Women workers face the lowest wages and most precarious jobs. They are the first to be fired as capitalists cut their production costs. They bear the brunt of government neglect in providing quality public social services. Millions of women are forced to migrate to foreign lands to survive and face the same exploitation and oppression abroad. The past years have seen women at the forefront of the struggle against violence and oppression. Peasant and Indigenous women have organized to lead campaigns against landlords, land grabbers and transnational corporations. 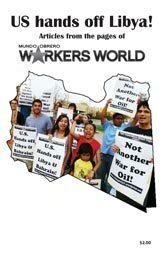 They have mobilized to halt large mining and extractive projects that jeopardize the environment and destroy the earth. Women workers have joined marches to demand jobs, decent wages and better working conditions; they have joined unions and stood on picket lines to protect workers’ rights and demand higher wages. In industrialized countries, massive protest actions are being launched against austerity, government cutbacks, systemic racism and discrimination. In the United States, within “the belly of the beast,” the Black Lives Matter movement, with women at the forefront, has rocked the bastions of systemic racism and modern slavery, challenging police brutality, the militarization of neighborhoods and oppression of people of color. More and more women are joining the struggle to fight for their rights and many more are joining resistance movements against the wars of aggression, and for sovereignty and national liberation. This is our militant tradition and we are upholding it this March 8, International Working Women’s Day. 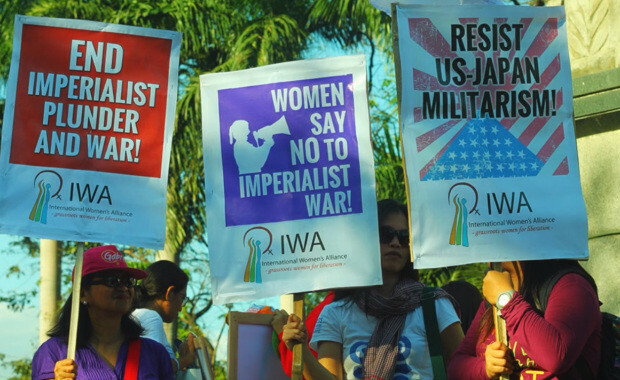 Women say no to imperialist wars of aggression! Jobs not bombs! Social spending not war spending! Women fight for national and social liberation! Go to internationalwomensalliance.wordpress.com for more information.